LeBron James has had several rivals in his career: Paul Pierce and the Boston Celtics, Joakim Noah and the Chicago Bulls, Paul George and the Indiana Pacers, Tim Duncan and San Antonio Spurs and, most recently, Stephen Curry and the Golden State Warriors. Nov. 6 — James and teammate J.R. Smith appear on stage with Clinton at a Cleveland rally, doubling down on his Oct. 2 endorsement. Nov. 9 — James, like many Americans the morning following the election, expressed dismay over the outcome. Taking to Instagram, with Kendrick Lamar’s Alright as the backdrop, James said, “Minorities and Women in all please know that this isn’t the end, it’s just a very challenging obstacle that we will overcome!! The man above will never put something in our paths that we can’t handle no matter how difficult it may feel/be! To all the youth out there I PROMISE I’ll continue to lead u guys every single day without no hesitation!! Nov. 10 — James and the Cavaliers visit the White House — the same day as Trump, no less. When asked whether he would visit 1600 Pennsylvania Ave. during a Trump administration, James noted he’d cross that bridge if he were lucky enough to capture a fourth title. Nov. 11 — James, at a shootaround before the Cavaliers’ game against the Washington Wizards, attempts to come to grips with the country’s new direction. “I mean, he’s our president. And no matter if you agree with it or disagree with it, he’s the guy, and we all have to figure out a way that we can make America as great as it can be,” he said. “So we all have to figure out a way that we can better our country because we all know that and we all feel it. This is the best country in the world, so we all have to do our part. It’s not about him at all. Especially not for me and what I do.” Italics mine. On Monday, reports confirmed that James and several Cavaliers teammates choose not to stay at Manhattan’s Trump SoHo (the hotel bears Trump’s name via a licensing agreement) as they prepare for Wednesday night’s game versus the New York Knicks. The Cavs have a contract with the establishment, but the players have been excused by the Cavaliers organization. The Memphis Grizzlies, Milwaukee Bucks and Dallas Mavericks organizations have apparently made similar decisions about Trump hotels, for varying reasons, and at various times. In May, Trump did wish James “good luck” heading into his Finals rematch with the Golden State Warriors. The business baron by day and seeming political instigator/presidential candidate by hobby understood he gained to profit something far more lucrative than money from a Cavaliers championship. James’ crowning achievement would only increase excitement for his coronation a month later at the Republican Party’s national convention in Cleveland. 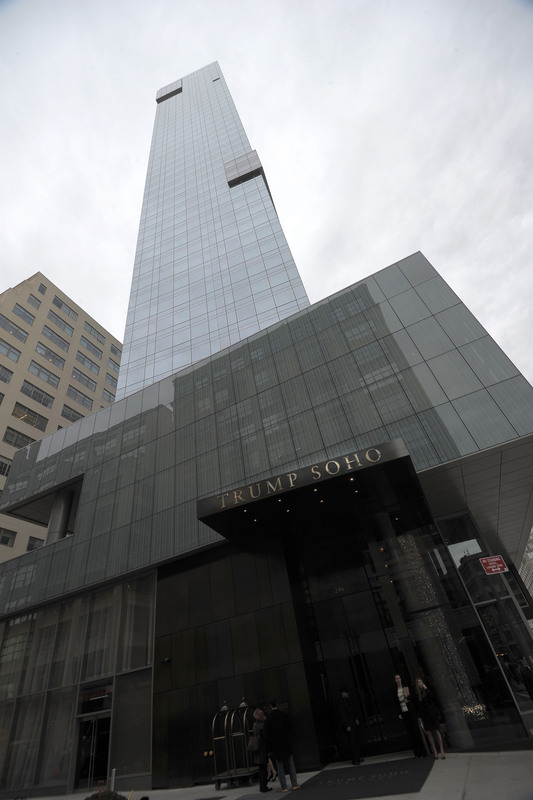 General view of the building exterior during the ribbon cutting ceremony for Trump SoHo New York at Trump SoHo on April 9, 2010, in New York City. Nevertheless, Trump isn’t the only president currently on James’ bad side. The other is Knicks team president Phil Jackson. Jackson’s “posse” comments regarding James — not the first time he’s used the language to describe him — lit a match last month, igniting a larger conversation about race and coded language. The 11-time champion head coach said James, as a member of the Miami Heat, once wanted to stay overnight in Cleveland following a game. “You can’t hold up the whole team,” Jackson said, “because you and your mom and your posse want to spend an extra night in Cleveland.” Context was later provided for James’ request. It seems the game in question was likely near Thanksgiving 2013. He and his teammates held a holiday dinner at James’ house in Cleveland in order to avoid celebrating in a hotel conference room in Toronto. James took offense stemming from the word’s stigma. His so-called “posse,” his closest friends run and evolve his empire. James placed No. 11 on Forbes’ World’s 100 Highest-Paid Celebrities. Carmelo Anthony, a spokesman on social injustice in his own right, sided with his fellow 2003 draftee along with Houston Rockets’ guards James Harden and Eric Gordon, as did Detroit Pistons head coach Stan Van Gundy. In frontier times, “posse” had law enforcement connotations. It was used in the 1980s by those in the hip-hop community to describe a rapper’s friends and crew. So it essentially means, in effect, a group of black men with common interests and a singular musical purpose. But when spoken with condescension, and seeming disdain? And there’s also the timing: Why describe James, his friends and successful business associates in such a way given the time frame when black men are continuously examined, critiqued and frequently chastised under such an intense microscope? James’ return to Madison Square Garden, two miles from the Trump SoHo at which he canceled accommodations — is somehow Wednesday night’s least polarizing storyline. The combination of LeBron’s unmatched athletic power and influence during the prime of his career plus long history of willingness to inject his voice and actions on issues far beyond basketball place him in the delicate bubble of megastar athlete and cultural critic. Only few athletes with his combination of talent and reach have ever understood the stratosphere he currently inhales not only in pop culture, but the national conversation at large. Others? Names like Ali, Russell, Kareem, Brown and, more recently, Serena to name a handful. In simpler terms, he’s a young black man bucking against older white men. Not only for his beliefs, but also his image in a society looking more and more like him. The historical lineage of this cannot be lost merely in James’ pursuit (and increasingly very real capture) of Michael Jordan’s GOAT status or perchance a Finals rubber match with the Warriors. This precarious responsibility now deposits him in the crosshairs of a man, widely described as a loose cannon, who assumes control of United States in 45 days and arguably the greatest leader of men NBA sidelines has ever seen. And neither president of which he seems invested in backing down from anytime soon. The last time someone entered New York with this much beef? Snoop Dogg ended up kicking buildings over in Tha Dogg Pound’s 1995 NY, NY video. Unfortunately, this time, it’s the Knicks who may suffer the most.